For an artist like Florence Welch, the second album is tricky. Will it catapult her into the Top 40? Will she maintain even an ounce of indie cred, or be relegated to guilty pleasure playlists? As songs from Lungs continue to haunt movie trailers and car commercials, Florence and the Machine appears to be moving dangerously close to ubiquity. For me, then, sophomore effort Ceremonials begs the question: can I still own my girl crush? I realize that’s probably not the question running through your mind, but bear with me. With her crazy red hair, kooky style, and songs about stabbing girls’ eyes out, Flo is endearingly eccentric–a refreshing and indie-appropriate superstar. Though flanked by a self-professed Machine, she and debut album Lungs never felt like products of one. 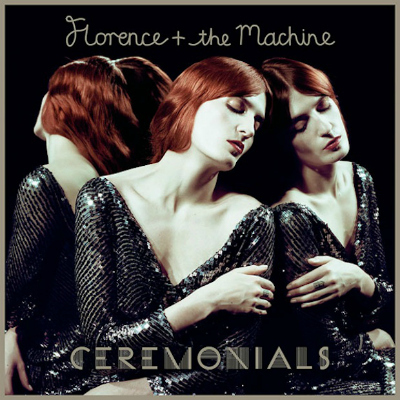 Ceremonials had a lot to live up to: it needed to bring the same quirky grandeur as its predecessor, or my admiration would end up in one of her boys’ coffins. As it turns out, the album is true to 2009’s debut. Its fifteen tracks are cut from the same flamboyant cloth as hits like “Rabbit Heart (Raise It Up)” and “Howl,” prompting me to spout a word I never thought I’d use: expected. Ceremonials abounds in accessible epics–“Shake It Out” and “Spectrum” are standouts in that respect, providing chill-inducing moments and potential sing-alongs galore. (I can hear them in karaoke bars already.) What it’s missing are oddballs like “Girl With One Eye,” or even the kickass blast of “Kiss With a Fist.” It’s not that Florence and the Machine doesn’t rock expansive pop (indeed, they’ve damn near perfected it)–it’s that Ceremonials walks the fine line between cohesion and sameness, strength and overwhelm. Mostly, though, it falls on the right side of the line. Even if the album doesn’t break much new ground, it’s a more-than-solid sophomore effort. Florence and producer Paul Epworth have crystallized the sound they developed on Lungs–not surprisingly, he contributed to the aforementioned “Rabbit Heart (Raise It Up)” and “Howl,” among others. They’ve found a formula, and it works. Ceremonials will undoubtedly win the band more fans, and find its way into more movie trailers, but that doesn’t mean I can’t adore it. Because I can’t help but adore her, and this album is still uniquely Flo.